First meeting of the self-build working group. Ministers have met with self build industry leaders to launch a powerful new group to advise them on how to cut the red tape and regulations that are stopping aspiring self-builders from realising their ambitions. Since Grant Shapps called on the country’s aspiring self-builders to make a housebuilding revolution their New Year’s resolution last month, the National Self-Build Association has been working with his officials to set up the group whose task it will be to develop an action plan to tackle the main barriers to the growth of self-build housing - such as availability of land, finance and expert support for people new to the industry. Today’s meeting with Housing Minister Grant Shapps and Communities Minister Andrew Stunell will see the first meeting of the working group to begin to work through these issues, and agreeing concrete steps to try and increase the number of self-builds up and down the country. 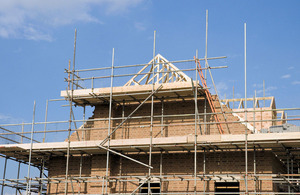 Self-builders are already Britain’s largest housebuilder, and account for about one-fifth of Britain’s new homes each year, but for far too long the aspirations of ordinary people to build their own home have been thwarted by barriers and red tape. These obstacles have led to the UK having one of the lowest proportions of new homes built by self-builders in Europe. The government has pledged to end self-building as the preserve of the privileged few, and enable aspiring self-builders to put building their own home at the top of their New Year’s resolutions. “Self-builders already make a big contribution to new homes built in this country each year - yet we still lag behind most of Europe. I want to turn around the fortunes of self-builders by cutting the red tape and bureaucracy they often face. “That’s why I’m delighted that the National Association of Self-Builders has agreed to work with my officials to identify the barriers that aspiring self-builders often face, and to let us in Whitehall know what we can do to make it easier to help people achieve their dream of building their own home. “Self build housing forms an important part of the government’s strong commitment to increasing supply of affordable and sustainable homes. Self build initiatives are both good for communities and the environment. They can help to regenerate abandoned urban sites, and ensure that countryside communities remain vibrant places to live and not museums. “Most people think building your own home is very expensive. They see many of the fancy homes featured on Grand Designs and think that’s what it’s all about. In fact the vast majority of self build homes cost less than £150,000 to construct - and for that you can comfortably build an attractive, energy-efficient, custom-designed 3 or 4 bedroom home.